A few weeks ago I wrote a post about a creative writing task I had, as part of a course for my PhD. The title was a Definition In Two Parts: Fear. 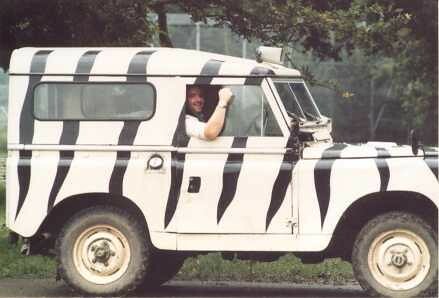 It was based on something that happened to me whilst I was working as a ranger at a safari park in the UK. What I didn’t mention was that, working in a place like that, well, let’s just say, it would give you plenty of material to use. Oh, and one more thing, the lion, tiger, and bear pictures featured in this post weren’t taken by me. They were all taken by another ranger employed at the park in the mid-late 1980s; a dear friend who I absolutely haven’t seen or heard enough of in the last few years—Tony Lewis. Thank you Tony, all the very best my old friend. That’s close as in shut, not as in near. Every night at closing time, the keepers on sections throughout the safari park would wait for those words from the curator—a mean-minded Australian we used to call Dodgy (amongst other things). He wasn’t a nice guy, and neither was his boss, a children’s TV, wild animal show host, and general manager of the park. Profits came before animals or people was the lasting message I took from my management team. But this little story isn’t about their shortcomings, it’s about mine. Close-up would mean put the animals away into their respective night dens. There were thirty-something lions, seven-or eight tigers, and another seven or eight bears on our section alone, and they were most definitely not allowed to roam their reserves freely overnight. If they had, it would not have been long before one or two made their way into town, to see what was on the take-away menu when the bars closed. To put them all away, we used four-wheel drive vehicles, and rounded them up a bit like cowboys on horseback. We would drive them toward gates and tunnel runs, where other rangers would direct them into their dens. We had guns in case anything went wrong, but most of us didn’t even load them… and to be honest, if we did, the public would probably have been at more risk from us than the animals. 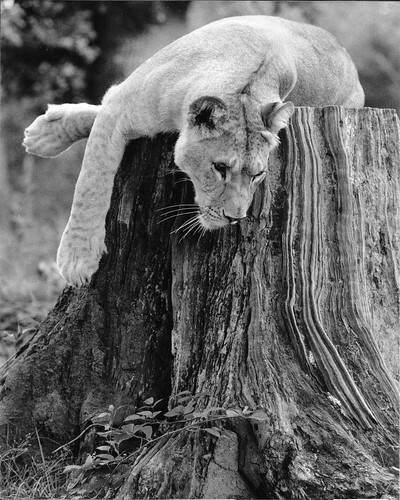 Pepper, female lion, about 2 years old. October, 1987. On the night in question, it had been raining for about four days solid, and the reserves were water-logged. Driving around on the wet grass would make one awful mess… which looked bad for the paying customers. The park needed to look presentable. Well, that posed a problem. If you can’t drive a vehicle onto the grass, how do you herd thirty lions into their dens? Especially when they might stand forty-plus meters away, just staring at you? And, if the whole process takes too long, it gets dark. Then you have to switch your vehicle’s lights on, which frightens the lions up into the trees. And how do you get a lion out of a tree without drugging it, shooting it (the lion, not the tree), or climbing up after it? You could use a blank shotgun cartridge, but that would usually spook the entire pride pretty badly. So, we used to throw stones; but to do that, you have to get out of your vehicle to throw the stones. 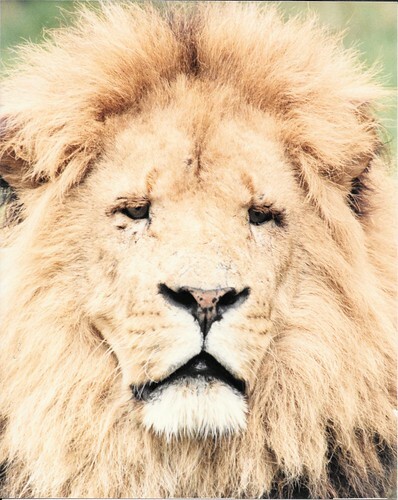 And the only way for the lion to come, is down, and you’re at the bottom. You can see, that all of this can get pretty complicated, pretty quickly. Anyway, we had orders from Dodgy not to drive on the grass, and we all valued our jobs too much to completely flout his directive. Especially when the tire tracks were so easy to see, and the culprits so easy to trace. I was putting the lions away that night, and was down to the last couple. They were two of the younger males, Bullitt (named after a Steve McQueen movie), and Floyd. Bullitt was fairly predictable as far as lions go, if you drove toward him and revved the engine a bit, he would usually get the message and head toward the night dens. So I started him off, and watched my mirrors as Bullitt headed in the right direction. Good boy. Bullitt, adult male lion… with that look of superiority, that only adult male lions can pull off quite so effortlessly. That pleased me no end. It was pay-day, and I had a serious amount of beer waiting for me at the nearest pub. Floyd on the other hand, could be a pain in the backside, he had been left until last… and now it was raining. Again. Hard. I headed back into the main reserve to look for Floyd where I last saw him. He was fairly easy to spot. He was one of our biggest males, with a beautifiul dark, almost black, mane. I spotted him sitting in one of the timber huts dotted around the reserve, that served as shelters, and sleeping platforms. This one was about fifty meters (150ish feet), from the road, and surrounded by a lot of very wet, soft, grass. No way was I taking my Land Rover over there. Even if, by some miracle, I could do it without making a mess of the reserve, I’d probably get my vehicle stuck and need a tow-out (very embarrassing). I stopped by the side of the road, as near as I could get to the big puss, and revved the engine. Floyd looked at me… with contempt. I revved again. I lowered the window down and yelled at him. Floyd looked lazily into the distance. I revved the engine and yelled obscenities. I thought the engine was going to explode. So I got out of my vehicle… something else the curator didn’t want us to do… but I ask you, how the hell else do you move the bloody lion? I suppose patience could have worked, but that was in fairly short supply at the time. I threw stones. I never hit him. I tried—really hard—but I still never hit him. Floyd lowered himself to his belly and closed his eyes. Bugger this, I thought, and, picking up a hefty stick, I started across the grass. This, was probably one of the stupidest things I have ever done in my entire life… and it has competition. 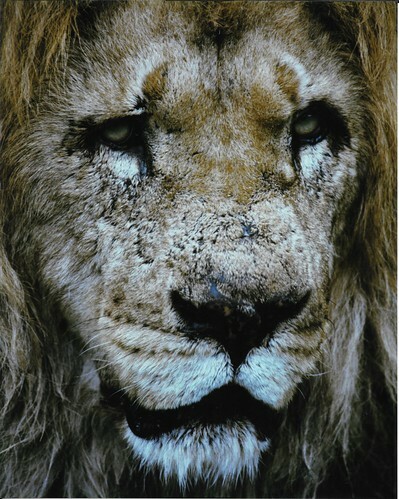 Slipping and sliding across the mud, it occurred to me that looking weak, pathetic, and only barely able to stand up, is number one on the list of things you don’t do in front of a lion. Okay, maybe number two after trying to run at one waving a stick. I stopped and threw more stones. Floyd sat up. I had his attention. Yes. Er, right. I had his attention. Twenty meters or so away from the relative safety of my vehicle, and the gun I had left there… unloaded. Right. The unadulterated stupidity of my situation was beginning to sink in. Turning around now, and slipping and sliding back to the car, was not really an option. Anybody that knows lions will tell you that looking weak and unusual in that way, is a guaranteed way of getting yourself in real trouble. You might as well hang a sacrificial goat around your neck at the same time… aaaaaaand that was precisely what I had been doing for the last few minutes. It was probably only due to Floyd’s inability to believe what he was seeing, that I was still alive. This isn’t Floyd, I don’t have a picture of Floyd. This is Lordy. he was a lot older. He had a huge, shaggy mane, and over-sized front paws. Taken about June 1987. By the time I got to the last dozen or so strides, I kind of regained my footing, and decided to give it the best shot I could. Waving my stick in the air, I shouted Floyd-related obscenities at the top of my lungs—mostly drowned out by the rain—and ran at the lion in the hut. Can you see a theme developing here? Darwin Awards here I come. The floor of the hut was a short step up, and I leaped into the air, aiming for the wooden platform. I suppose I was intending to give old Floyd a whack with my stick, and was hoping he decided to turn tail and run off to the night dens. I told you it was a stupid thing to do. But it was even stupider than you might think. I sat for a moment, nursing my head, and letting the rain wash the adrenaline out of my system. I looked down at my hands, and they looked like somebody else’s, shaking as they held my stick and my radio. I picked myself up, and headed back to the car. I really needed that beer. I’m flabbergasted by this one. Sad to say, yes seriously, it was “a day to remember”… and not the last stupid thing I did as a ranger, but likely the most. I’d like to say I’m older and wiser, but that’s probably not true. That was one of those jobs for people who think they have only themselves to worry about. These days, I like to make it home to my family.